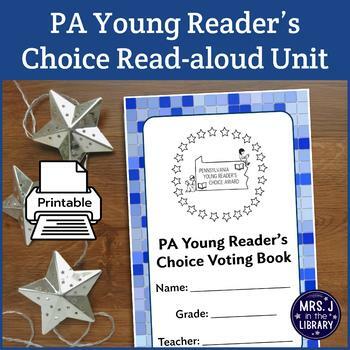 Introduce and read up to 15 books from the Pennsylvania Young Reader’s Choice Award nominations in this reading response activity booklet and lesson plan for kindergarten, 1st grade, and 2nd grade students. Now UPDATED for the 2018-19 school year! This unit is designed to be used as a series of library class lessons or as a literacy center in a classroom. 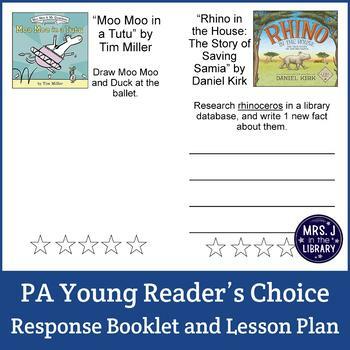 It is provided for FREE as a gift to PA librarians and teachers. Teachers and students from other states are welcome to use this product as well, though they are not eligible to vote in the contest. 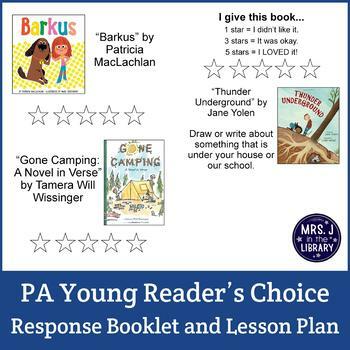 Each half-page has 5 stars for students to fill in based on their opinion of the book and a reader's response drawing (or simple writing) activity for one of the nominated books in the K-3 category. 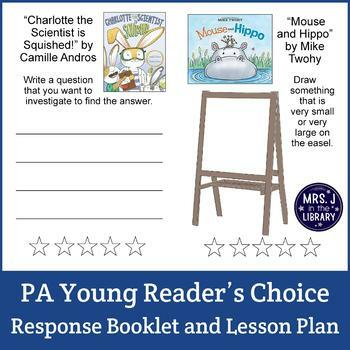 Each page is for one 30-40-minute block of time in which you can read the book, students will check out new books from the library, then complete the response activity.